Soil Excavation & Subsurface Demolition in Watts - American Integrated Services, Inc.
AIS was contracted to a implement an Interim Remedial Action Plan (IRAP) consisting of various depth soil excavation on a 23 acre site, which was formerly a steel mill, for future redevelopment by the City of Los Angeles Housing Authority. The site locale was densely urban, and was bordered by a low income housing project, an active high school, with major thoroughfares directly adjacent. Contaminants of concern were heavy metals (mainly lead and arsenic), PCBs, aromatic volatiles and fuel and oil range petroleum hydrocarbons, arochlor-1254 and naphthalene. Project work was conducted under daily, direct oversight of the DTSC. AIS prepared and implemented a site specific SWPPP and an SCAQMD Rule 1166 VOCs and dust monitoring plan, in compliance with State and City permit requirements. Air and particulate monitoring, establishing and maintaining real-time organic vapor, particulate, and aerosol monitoring in worker breathing zones and at the site boundaries was also conducted. Prior to commencement of excavation activities, AIS performed site demolition, which included removal of trees and other vegetation, removal of light and power poles, and removal and recycling of railroad tracks and ties. All above grade buildings had been previously removed from the project site, however deep concrete structures, foundations, perimeter walls, concrete slabs and asphalt paving remained. AIS demolished and removed, sized and processed these structures and foundations, resulting in 843 loads (21,000 tons) of concrete, 100 loads of asphalt (2,300 tons) and approximately 8,000 lf of railroad tracks. Processing of the concrete was done by breakers, sheers and pulverizers. Rebar was collected and recycled. AIS removed various utilities, including storm drain, sewer, water, gas, and previously unknown lines running throughout the property, and capped and plugged them at the property boundaries while protecting a main storm drain and sewer line transecting the site. During remedial excavations, previously unknown underground storage tanks, an elevator ram and a deep water well were discovered, abandoned by permit and disposed. Sides of the excavation were sloped to maintain safe work environment. 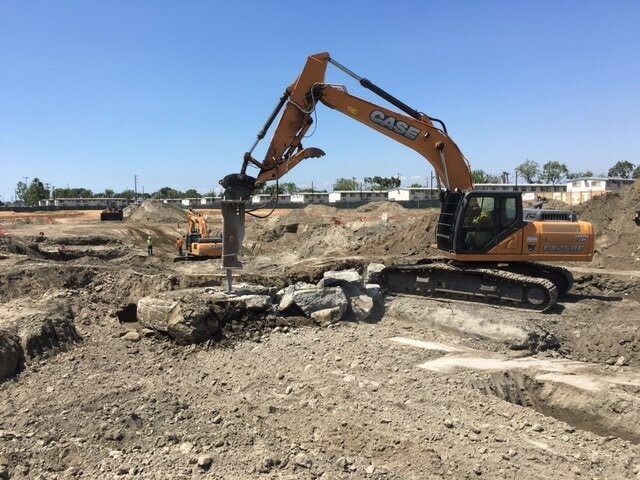 In total, over 1,400 tons of PCB impacted soil and concrete, 500 tons of RCRA soil, 5,000 tons of NORM waste, 210,000 tons of Cal-Haz soil, and 24,000 tons of Non-Haz soil were excavated, transported and legally disposed. Approximately 35,000 CY of certified clean fill was imported, placed and compacted to 90%. After rough grading and over-excavation, the site was finish graded to achieve finish elevations for future roads, parks and building sites. AIS used state of art GPS technology (Top Con) equipment to complete the finished grades. This project contained local hire objectives of 10%, which AIS exceeded by setting aside 30% of construction work hours for local, disadvantaged workers. AIS held job fairs, hosted and participated in community events, mentored a small local DVBE contractor, and added several local workers to our permanent payroll. During daily operations AIS used a water tower and water trucks filled with water and soil binder mixture to control dust and to stabilize the stockpiles and the roads. Full time sweepers were utilized to keep the streets free of debris and track outs. Over five million miles of trucking and 20,000 construction man hours have been expended to date on this project. Due to the vigilant application and adherence to the AIS Site Specific Health and Safety Plan, and safety on-boarding of the local hired workers, this project has experienced no safety violations or near misses.